Well I've finally gotten a chance to do my first product review off of products that I purchased recently. The products that I am reviewing today is from the brand LuminessAir which specialises in airbrush makeup. I was searching high and low for a bronzer that could contour and give that earthy glow to the face from light to medium skin tones and I looked at LuminessAir for a while. I should tell you though that when I first started to do airbrush makeup, I bought this brand but it didn't give (at the time, not sure if it changed) proper coverage that was also of a matte texture. However, after their recent revamping, I decided to give them another try and I purchased the items in the pic below. The bottles provide approximately 0.55fl oz of product which is water based and contain shimmers and highlights which are great for effects on both the face and body. The second one to the right, is a gold highlighter which I have used as both a face highlighter and as an eyeshadow. They both go through the airbrush without any clogging and when dried, the finishes were beautiful and blended really well. They didn't run or crack when I passed my hand over it. I haven't used the bronzer shimmer as yet (on the left) on clients, only on me, as I am still sorta picky as to choosing where to use it. The colors are very intense with a lot of shine and if not applied slowly and evenly, can be a bit jarring. So I would probably use it on a bride that is having an outdoor wedding where the sunlight would play with the skin as opposed to an indoor wedding - where my choice of makeup application would be more of a more matte nature and the lighting would not be natural. A really great place for me to use both would be an upcoming pageant called Ms. Elegant Mom in Cascadia Hotel, Trinidad which is happening next weekend. So the lighting would definitely be to my advantage for my contestant. The second set of bronzers, in the pic below, are matte in texture when they dry and I LOVE these. The finish is beautiful and very easy to control and layer so I don't ever have to worry about creating that 'drag queen' effect. They are the same colour even though the flash of the camera may make it look different. Overall, I feel comfortable with the improvements and I would easily recommend these to anyone who wants to create a bronzed airbrush look that is either sun-kissed or softly contoured. You can get these products at http://www.lumcos.com/. The purchase was easy and if you sign up for the club subscriptions, there are discounts which make it a little easier to afford (they are kinda pricey)! Until next time, I am signing off until my next review - Graftobian Powder Foundation Palettes! Well I have been really busy yesterday and today as I was sponsoring makeup for the Ms. Point Fortin Borough Pageant and with my bride (see previous post). There were 8 contestants and I used OCC makeup to see how it would hold up with heat and expected sweating. Overall the effects were pretty but the sweating did take a toll on them as I tweeted last night (which by the way I finished at 11:45pm). I also had to do the host (Yolandra John) & outgoing queen (also current Jaycees Queen - both lovely girls). There was a lot of touching up, which I don't like to do considering the benefits of airbrush makeup overall. Definitely going to TemptuPro again for that. I took some pics (couldn't get everybody) and they were in their costumes and these show how pretty stage makeup could be without the obviousness of it. Here's a quick view of my bride today - La Toya, really pretty but her skin is somewhat marred with scars on the skin but overall her skin tone was even for the makeup. Guess what? I finally used the aireyeshadows along with the aireyeshadows along with the usual regime of the foundation and everything was really beautiful. 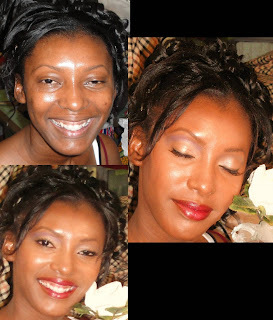 This makeup is truly transformational along with the contouring capabilities of it. Yesterday I had a wedding with initially a bride to do makeup for, however it turned into the bride and her chief bridesmaid with lovely eyebrows. Here is a pretty pic of what I call my princess bride. I just rushed to put this on so I didn't breakdown the makeup used. Will do that in another posting. But, I am still preparing my blog reviews and I decided on actually submitting them every few weeks so I won't feel bogged down or too swamped. yaaay! The review I will submit later today. Well I am going to review later in the week my separate hauls that I was so anxiously waiting on and the products are from TemptuPro, LuminessAir & Graftobian. I have taken out pics and stripe tests to see what they really look like so I will also be using these as my references. Exciting! Review Time! Look out for it and I hope that this can actually help a makeup enthusiast or artist out there make better choices. 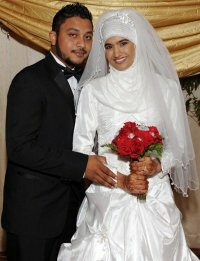 As I promised, my second beauty of a muslim bride is Farah and her final pic is here. Her makeup was of course airbrush based along with some conventional selections. If there is ever a time that the makeup must stay put is whenever I come into contact with muslim brides and their beautiful hijabs. The amount of movement that will occur to put them on, with conventional makeup will ultimately streak and leave 'footprints' on the garments. That's why, to me, its even more imperative to ensure that the makeup is resistant to movement and the airbrush will always be the best choice. As I mentioned before, I reduced any use of powder so there wouldn't be any mishaps, hope you guys like it!